Our broad portfolio of unit-dose packaging formats and configurations helps institutional pharmacies develop a comprehensive unit-dose packaging strategy. This helps free up valuable pharmacy resources and improve quality and patient safety while reducing unit-dose drug purchasing costs. Safecor Health’s oral solid unit-dose packaging provides one-year expiration dating* and a range of packaging options including unit-dose strips, blisters and robot-compatible packaging. Our liquid unit-dose cups provide one-year expiration dating*, deliver an accurate dose to the patient and are available in hospital-specified dose and multiple cup sizes and colors (blue or red). Our unit-dose oral syringes provide six-month expiration dating* and include a bar-coded flag label and tamper-evident overwrap bag, also labeled and bar-coded. Additional options include tamper-evident red caps and ENFit compatible syringes. We offer robot-compatible packaging, robot bar codes and robot overwraps. Repackaged robot medications come on a cardboard tube to facilitate robot replenishment. We support the unit-dose repackaging of 340B purchases for Covered Entities (hospitals) through their wholesaler via 340B/GPO/WAC bill to/ship to ordering accounts that are integrated into a hospital’s existing split-billing system and accumulators. RFID tags allow hospitals to reduce the time and error associated with manually restocking pharmacy kits and anesthesia trays. Safecor Health provides RFID tagging services for specified vendors (ex. Kit Check) so that fast-moving products arrive at your institution pre-tagged and ready to replenish into specific kits via the vendor’s software. 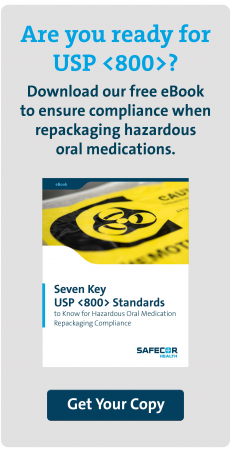 Safecor Health supports the unique handling and dating requirements of various respiratory medications and provides a unit-dose package with a bar code in flag-label or over-bag formats. Safecor Health’s unit-of-use oral solid bottles meet FDA requirements for state drug stockpiles and point-of-care dispensing in emergency departments and outpatient clinics. The unit-of-use bottles are fully labeled and bar-coded, include child-resistant caps and tamper-evident inner foil seals, and provide one-year expiration dating or longer for stockpiles. *Expiration dating is supported by a stability testing program. There may be product exceptions to standard expiration dating. We help you reallocate valuable pharmacy personnel and capital resources away from packaging to other critical areas of your pharmacy. We help you purchase at the lowest cost per dose for all of your unit-dose needs. We help you reduce risk while improving medication and patient safety.